Representatives of SPbFRI took part in the forum "Logger of the XXI century"
III Championship of Russia "Logger of the XXI century" was conducted from 9 to12 August in the Arkhangelsk region. Director — Vasilyev I.A., deputy directors — Stepchenko A.A. and Petrunin N.A., head of the research department of economic studies — O.I. Vasilyev, head of the research department of forest management and forest regulation — Romanyuk B.D. took part in the "round tables" of the event from SPbFRI. The Championship of Russia "Logger of the XXI century" was held with the support of the Ministry of Natural Resources and Ecology of the Russian Federation, Federal Forestry Agency and Ministry of Industry and Trade of Russia. Minister of Natural Resources and Ecology of the Russian Federation Sergey Donskoy and the Deputy Minister, head of the Federal Forestry Agency Ivan V. Valentik have made welcoming speeches to the participants of the Championship. 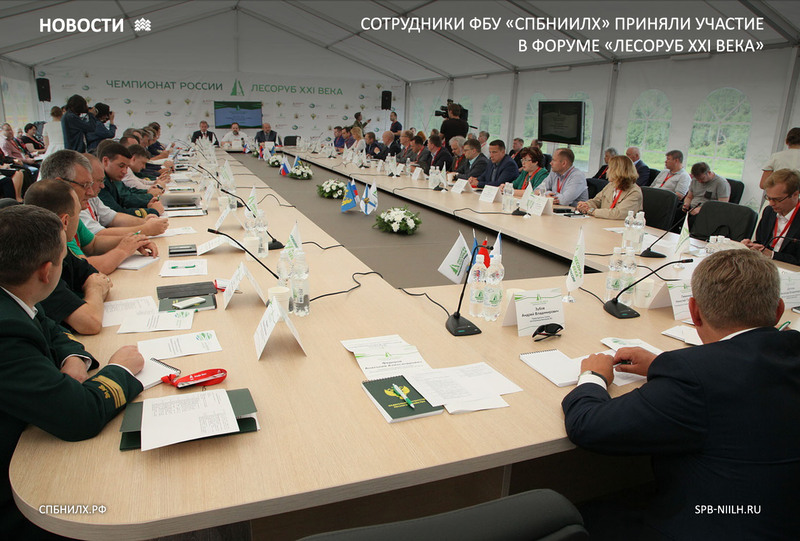 Particular attention on the discussions of Forestry Forum within the framework of the Championship was paid to the implementation of intensive model of forest management in Russia. Panel discussion was devoted to this topic, at which Romanyuk B.D. from the SPbFRI was presented a report "Scientific support ("author's supervision") of the process of transition to a model of intensive use and reproduction of forests in pilot forest areas." Heads of the relevant federal structures, representatives of the deputy corps and public environmental organizations, as well as members of the business communities took part in the discussion. Moderator of the session — Valentik I. V., head of the Federal Forestry Agency noted that the introduction of an intensive model of forest management will become the basis of the state policy in preservation, protection and reproduction of forests on the territory of our country. In the work of the Round Table "Production of planting material with a closed root system: technological and economic aspects" the following persons participated from SPbFRI: deputy directors: Petrunin N.A. with the report "Optimum model of organization of planting material growing" and Stepchenko A.A. with the report "Problems and design features of greenhouse complexes for growing seedlings with a closed root system", the Head of the Research Department of Economic Studies Vasilyev O.I. with the report "Economic aspects of production of planting material with a closed root system". The participants in the Round Table discussed the optimal model for the organization of growing planting material with a closed root system (CRS), design solutions for the creation of greenhouse complexes, technologies of growing containerized seedlings in greenhouses, and also touched upon the economic aspects of cultivation. Deputy Director Stepchenko A. A. attended with presentation "Acquisition of greenhouse complexes for growing seedlings with a closed root system with equipment and machining attachments" in the work of the strategic session "Prospects for the Development of Forest Selection and Seed Centers". Participants discussed the prospects for the development of seed and nursery economy in Russia, a number of decisions were made aimed at creating an optimal model for the development of forest selection-seed centers.